I've had so much fun hosting Presto Pasta Nights this past week. Not only did I get to see all of these great dishes before anyone else I also got to meet a lot of new and interesting bloggers. Thanks to Ruth for giving me this opportunity and thanks to everyone who submitted a recipe. AquaDaze from Served With Love really enjoys cooking with sun dried tomatoes. When she first made a pesto with them she was in culinary heaven. Her submission of Fusilli in Sun dried Tomato Pesto looks delicious. Jokergirl came up with a great vegetarian alternative to the traditional bolognese. You'll have to head to her blog to find out what the secret ingredient in her Veggie Bolognese is. Judith over at Think On It has come up with a simple pasta dish that reminds her of Green Eggs and Ham. Hence the name Pasta Dr. Seuss. Kristin from Sogkonnite Living shares a Cauliflower Feta Pasta Bake that makes a quick and easy week night meal. When tomatoes are .99 a lb Lesley over at Beach Lover's Kitchen buys them up and makes interesting pasta sauces like her Fettuccine with Shrimp and Pineapple in a Tomato Sauce. Crab and Cherry Tomato Linguine is a quick and easy dish submitted by Abby at Eat the Right Stuff. Ever wonder about substituting broccoli for brocolli rabe in a recipe. 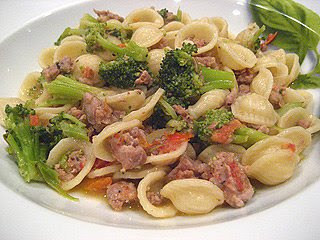 Well Stacey over at Stacey Snacks does that in her Orechiette w/ Sausage & Broccoli and it looks delicious. 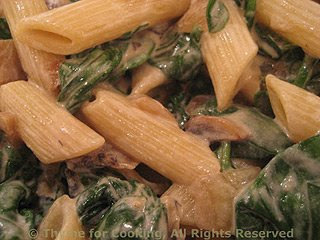 Katie over at Thyme for Cooking is having some horrible plumbing issues but she still manages to turn out a delightful dish of Pasta with Fresh Spinach and Chevre. 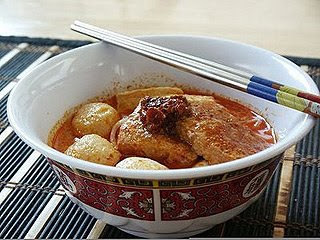 Do you wonder what the difference between "Singapore laksa and Malaysia laksa is" well Ching over at Little Corner of Mine shares with us that answer and her recipe for Singapore Curry Laksa. Spicey Roasted Eggplant Penne is what Terry from Got No Milk submitted. It sure looks yummy. 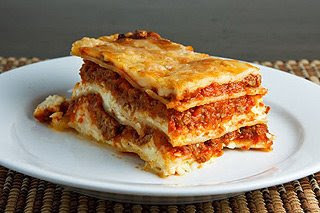 Lasagna is one of my favorite pasta dishes and it's also what was submitted by Kevin at Closet Cooking. 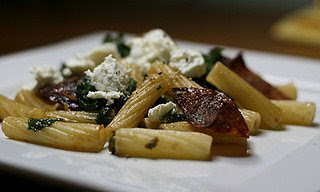 To make use of some salami that's been in her fridge Pam from Side Walk Shoes shares with us a recipe for Penne with Wilted Arugula and Salami. Karen of Karen Cooks has dished up, what she calls, a meal fit for a queen: Spinach and Three Cheese Stuffed Shells. 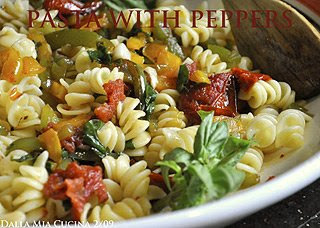 Laurie over at Dalla Mia Cucina submitted this beautiful dish of Peppers and Pasta. I love all the colors. Daphne from More Than Words decided to experiment with some ingredients and came up with Sweet Chili BBQ Beef on Noodles. 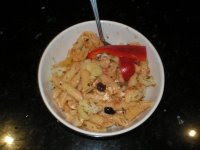 Looking for a pasta dish that's healthy and flavorful check out San Marzano Chicken with Fusilli submitted by Janet from LaDue & Crew. It's hard to find Chicken Stroganoff in Singapore that's why Starningblue at Deery Lou Aroma decided to make her own. 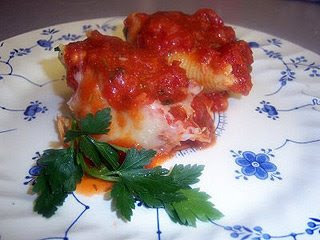 Ruth the founder of Presto Pasta Nights has a recipe for Porcini Stuffed Tortelloni on her blog Once Upon a Feast. Muneeba over at An Edible Symphony shares with us the very first casserole she's ever made; Chicken Spaghetti Casserole. Maude of Baking Delights uses the freshest ingredients when she makes Pasta Primavera. 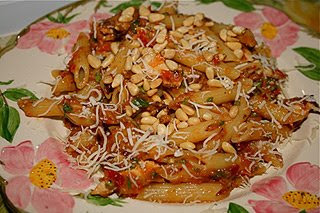 And last is my submission for Penne with Sunday Pork Ragu. I wish I could have a taste of every one!! What a delicious round-up!! You did a great job! Awesome roundup. Thanks so much for taking the reins this week. You did a fantastic job. Now for the hard part...which one to choose first. Thanks everyone for sending in such tasty dishes. Everything looks amazing, can't decide what to make first! I must be in pasta heaven!! This is such a good roundup - lots of fantastic and creative pasta dishes here. Fantastic roundup. Every dish looks delicious! Incredible how so many amazing dishes everyone can come up with- I'm in Pasta heaven. Great dishes, everyone! Wow! I'm positively drooling right now - what a huge roundup and so many tasty-looking dishes! Absolutely delish roundup! Thanks for my inclusion among such great cooks. This is such a good roundup. Great job hosting! fantastic round up! With so much variety around, one can never tire of pasta! This was fun and I love all the recipes, I hope to join in again! Those dishes all look super. I don't think I could pick a favorite! Forgive me Theresa for missing your party!! I had good intentions, but it never panned out! I promise to not miss the next one! You did a great job hosting, the roundup all looks delicious! Ack! I'm so sorry I'm just now making it over here. You did a great job and all the pastas look beautiful. Thanks for hosting! 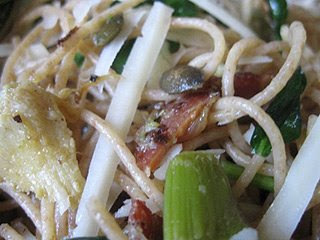 I totally want to make the crab linguini and the pasta with spinach and chevre. Yum. everything looks so yummy! all this pasta is making me hungry! Thks for posting my very first PPN entry! But forget that .. will u just LOOK at those other pastas??! My stomach just let out a big growl.